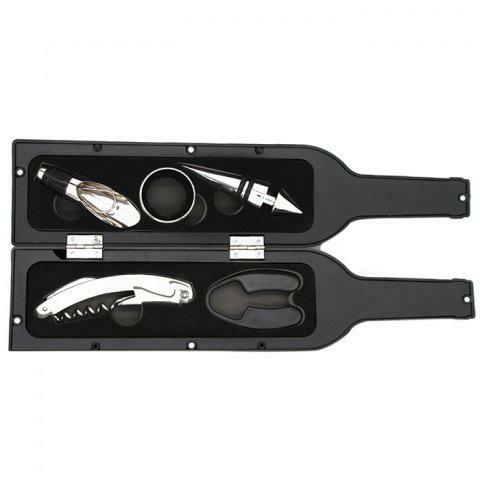 Includes CORKSCREW OPENER, FOIL CUTTER, WINE STOPPER, DRIP RING, and WINE POURER. This is a must have set to better enjoy your wine! STAY ORGANIZED and EASY STORAGE - With all the tools necessary for opening any wine bottle, our 5-piece wine opener set is organized and easy to store. The novelty bottle shaped case is equipped with magnets, so you can easily open and close the case without effort. QUALITY CONSTRUCTION - Drip ring, pourer, and stopper are made with high-quality stainless steel; Corkscrew opener is reinforced with aluminum alloy and our unique handle for an ergonomic grip so you can easily open any wine bottle.